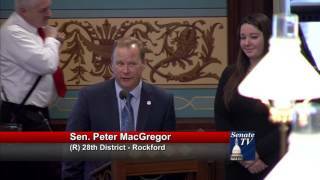 Senator Peter MacGregor, R-Rockford, honors Meg Vindischman for her service to the Michigan Senate. 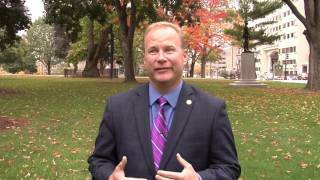 Senator Peter MacGregor, R-Rockford, wishes everyone a Happy Thanksgiving. 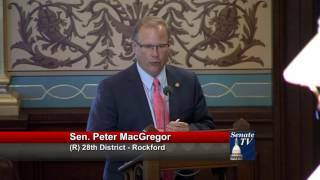 Senator Peter MacGregor, R-Rockford, discusses Senate Bill 992 which regulates drone use during the October 19, 2016 session of the Michigan Senate. 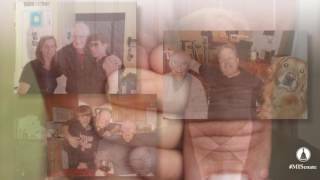 Senator Peter MacGregor, R-Rockford, reflects on Father's Day. 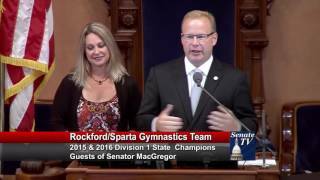 Senator Peter MacGregor, R-Rockford, honors the Rockford/Sparta Gymnastics Team at the Michigan Senate for their state championship season during the May 25, 2016 session.